Endosymbiotic neuronal archaea can produce cerebellar cognitive affective disorder. It can lead to an autonomic neuropathy with sympathetic overactivity and parasympathetic suppression. This leads to metabolic syndrome x, cancer, neurodegeneration, schizophrenia, autism and autoimmune disease. Archaea can synthesize porphyrins from cholesterol. The cholesterol ring is catabolized to pyruvate which then enters the GABA shunt pathway generating succinyl CoA and glycine the substrates for porphyrin synthesis. The increased amounts of porphyrins in the system leads to absorption of low level EMF leading to prefrontal cortex atrophy and cerebellar dominance. Cerebellar dominance leads to activation of sympathetic system and parasympathetic suppression. The archaea produces the Warburg phenotype by inducing HIF alpha. This results in inhibition of PDH resulting in defective formation of acetyl CoA and acetyl choline producing a parasympathetic neuropathy. The archaeal porphyrins can produce reactive oxygen species by photooxidation resulting in stress and sympathetic overactivity creating an excess of epinephrine, norepinephrine and dopamine. Stress and sympathetic overactivity as well as elevated cortisol can lead to beta amyloid accumulation. This can lead to neurodegeneration. Sympathetic overactivity can produce vasospasm leading onto coronary artery disease and stroke. Sympathetic overactivity and vagal block can produce defective insulin secretion and diabetes mellitus. This contributes to the genesis of metabolic syndrome x. Sympathetic overactivity and vagal block can produce immune activation and autoimmune disease. Immunity is regulated by a vagal reflex. Sympathetic overactivity and parasympathetic blockade can lead to cell proliferation and malignant transformation. Stress induced sympathetic overactivity and cholinergic underactivity can contribute to autism and schizophrenia. 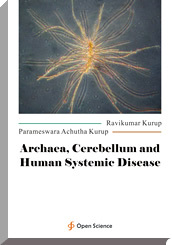 Thus an archaeal induced autonomic neuropathy with sympathetic overactivity and parasympathetic blockade can contribute to systemic disease. This results from the archaeal induced Warburg phenotype and PDH blockade resulting in defective acetyl CoA formation as well as increased prophyrinogenesis occurring via the GABA shunt pathway.